Make sure you are on our mailing list to receive updates . Join us November 2019 for our next season. The Mini Musical will consist of a 2 week rehearsal session culminating in two performances at the end of the session. It is called the mini musical because of its shortened rehearsal schedule. All cast members have stage time & performing opportunities. There will be a participation fee of $50/child. Sibling discount is $40 per child. Tickets will be required to see the performance and they are $5 each. The fees are to cover expenses and royalties. Fees are non-refundable. CCCMT provides the costumes. Wendy Anderson, 277 S. Ridge Road, Cedar City, UT 84720. Please complete the registration form below and submit the participation fee to participate. There will be a maximum number of children allowed in each show, as well as a minimum number required to ensure the production. The quality of experience that we want each child to receive is one of our main reasons for limiting the number of children that can be in the show. We will hold a group audition a few days before the first rehearsal where everyone who is registered will learn the songs and lines and then we will determine the cast list. We will rehearse a total of 2 - 3 hours each day, 5 days a week, for 2 weeks, including a dress rehearsal, followed by 2 performances. Practices are 4:30 to 6:30 PM, with some kids needing to stay until 7:30 and are held at the CMT building, 1579 N. Main Street, Suite #108. 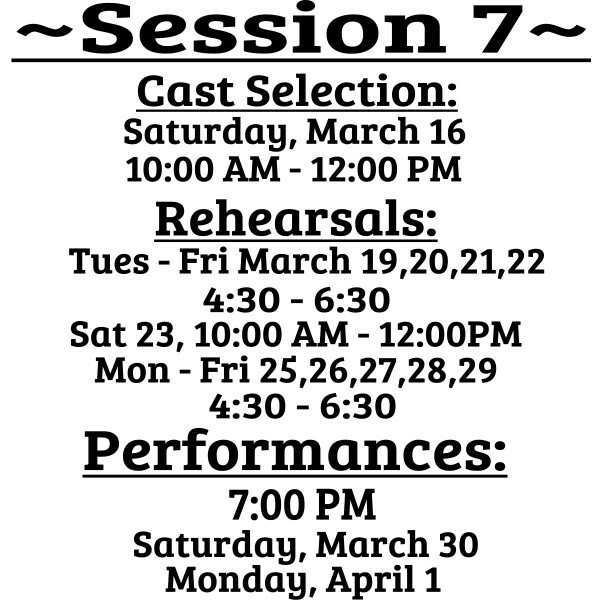 Everyone registered must have a clear schedule and be able to attend all rehearsals. Please choose a session where there will be no conflicts. Because of the short amount of rehearsal time, we do not allow missed rehearsals. Please make the 3 weeks of rehearsals a priority over all other activities. To be determined, but 6-9 sessions, depending on interest.